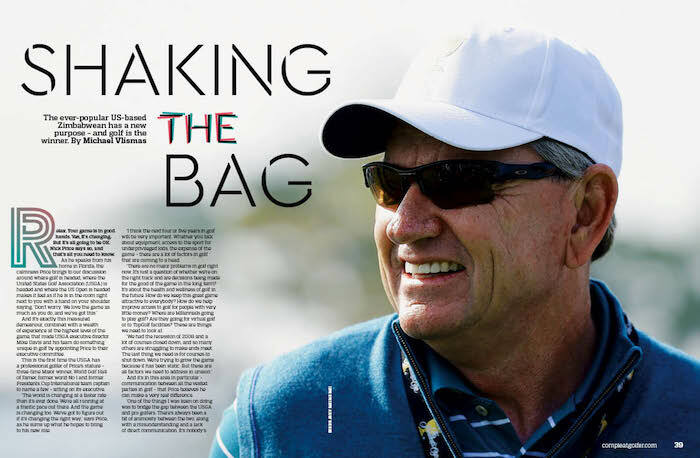 Nick Price, the ever-popular US-based Zimbabwean, has a new purpose – and golf is the winner, writes MICHAEL VLISMAS in Compleat Golfer. Relax. Your game is in good hands. Yes, it’s changing. But it’s all going to be OK. Nick Price says so, and that’s all you need to know. And it’s exactly this measured demeanour, combined with a wealth of experience at the highest level of the game, that made USGA executive director Mike Davis and his team do something unique in golf by appointing Price to their executive committee. This is the first time the USGA has a professional golfer of Price’s stature – three-time Major winner, World Golf Hall of Famer, former world No 1 and former Presidents Cup International team captain to name a few – sitting on its executive. ‘I think the next four or five years in golf will be very important. Whether you talk about equipment, access to the sport for underprivileged kids, the expense of the game – there are a lot of factors in golf that are coming to a head. ‘There are no major problems in golf right now. It’s just a question of whether we’re on the right track and are decisions being made for the good of the game in the long term? It’s about the health and wellness of golf in the future. How do we keep this great game attractive to everybody? How do we help improve access to golf for people with very little money? Where are Millennials going to play golf? Are they going for virtual golf or to TopGolf facilities? These are things we need to look at. can make a very real difference. fault other than there hasn’t been anybody there to bridge that gap. ‘I’d like to show pro golfers that the USGA is not the enemy. They are the guardians of the game and they make decisions on the game, but they also want to listen to what everybody has to say. There needs to be more communication. They have a great rapport with the R&A and that’s always been the case. ‘But a lot of people have a substantial amount invested in this game, be it the pros or equipment companies and so on. ‘I think the USGA has done a wonderful job in recent years of trying to communicate better, and that’s a positive thing. Having met with everyone on the USGA executive committee and knowing all of them, I can tell you there are some incredibly smart people when it comes to organisational skills, marketing and technical elements. And every single one of them has their heart in the right place. They want to do what’s best for the game, and that’s impressed me most. There are no hidden agendas. They’re a great bunch of people who are misunderstood because of a lack of effective communication between the parties. The US Open is often the greatest touchstone reflecting sentiment around the USGA, particularly among the professionals. Even here, Price is going to have immediate input. At the beginning of May, he was ready to join the USGA’s advance party to Shinnecock Hills, which included a walk of the course with Davis to see what needed to be improved upon for the championship and consult on elements of course set-up. And he once again brings perspective to an event that has had some controversial moments when it comes to course set-up. ‘I think the USGA wants the US Open to be a very good test of golf where all the clubs in the bag are used, and where there aren’t any negative issues with the golf course. US Open was last played at Shinnecock. Just think how much has changed in the game and in the USGA in 14 years. It’s a different championship in that sense. ‘The USGA tries to stay ahead of the game, and when it comes to the US Open, the challenge is to keep figuring out what is going to make the course a great test for the players and what is going to keep the US Open as the ultimate test of golf. As much as he had his own trials and frustrations with the US Open in his playing career, Price believes there are certain non-negotiables when it comes to the course set-up of this – or any other – Major. ‘Every Major should have a firmness to the golf course which penalises errant shots. Golf is two games. It’s played in the air and on the ground. The best golf courses test both of those. I think it’s going to be important to get firmness on the fairways. I’m not saying they must be like concrete, but if you mis-hit a shot, it must run off just like the links courses. In just the short time we’ve spoken, you can see why long dinners and lunches or golf games between Price and Davis could have contained equally long and stimulating discussions, debates and even a few arguments about a passion shared by both these men – what’s good for the game of golf? ‘Mike and I have been friends for a number of years and have always shared ideas of what’s happening to the game and how it’s changing. What was just an offer to be a friend to bounce ideas off every now and then very quickly became one of the most unique positions in golf for Price. And you can rest assured, fellow golfer, your game is going to be much better for it. – This article first appeared in the June issue of Compleat Golfer, now on sale!